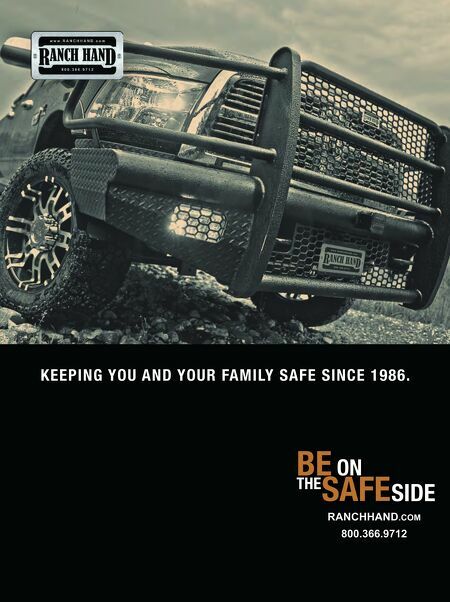 2 Restyling & tRuck AccessoRies | April 2015 restylingmAg.com Dirt Devil. Terrain-chewing Open Country R/T offroad tires by Toyo Tires aggressively pose on this upgraded 2014 Ford F-150. 6.Piggyback Marketing: king of the haMMers Keith Turner How to leverage major spectator events to boost shop marketing. 14.racing and retailing Jake Rishavy RPM Offroad holds the title as a championship race team and skilled aftermarket retailer. 30.the revenue restylers John Gunnell Accessories shop Toys For Trucks is experiencing an extraordinary hot streak. 36.iMProving inner Work life Jason R. Sakurai A professional and happy work environment increases production. 38.tiMe to look under the hood of your Website Jhan R. Dolphin Is your shop mobile-ready? 40.Product shoWcase: truck bed accessories Staff Liners, boxes, cargo devices and covers magnified. 50.neW ford f-150s Pose challenges for hitch Makers Bradley Worrell Corrosion issues force suppliers to redesign their fifth wheel and gooseneck hitch products. 56.aries autoMotive in toW Patricia Kaowthumrong CURT Manufacturing details future plans for its acquired Aries Automotive brand. 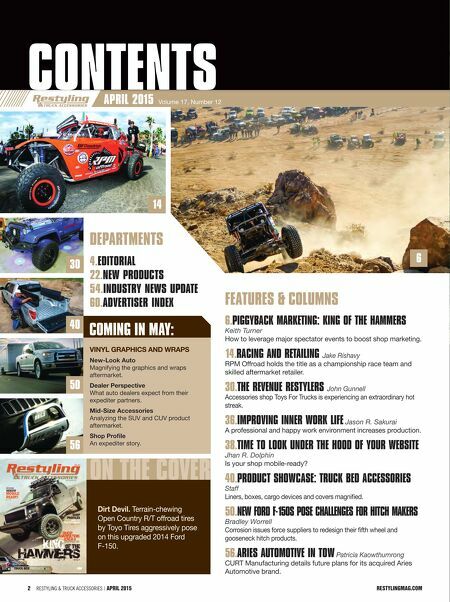 contents April 2015 Volume 17, Number 12 4.editorial 22.neW Products 54.industry neWs uPdate 60.advertiser index 40 50 56 30 6 14 DepArtments feAtures & columns on tHe coVer THE COVER coming in mAy: Vinyl Graphics anD Wraps new-look auto Magnifying the graphics and wraps aftermarket. Dealer perspective What auto dealers expect from their expediter partners. Mid-size accessories Analyzing the SUV and CUV product aftermarket. shop profile An expediter story.